Hey friends! How’s your week going so far? Are the days just flying past for you like they are for me right now?? I was brushing my teeth this morning and suddenly realized Christmas Eve is THIS weekend! Holy Smokes, you guys! Where did this holiday season go already? Are you locked and loaded?….ready with all your gifts? Did I just add to your stress? Ha! I’m still tying up some loose gift ends as I type this out. Luckily, places like Amazon and Uncommon Goods are great places to shop for thoughtful last minute gifts and if you get on it right now, they’ll be here in plenty of time for the big day. Also, for the ladies on your list, be sure to check out the can’t-be-beat gift sets at Baublebar as well. Here are a few things that are catching my eye for some last minute gifts still on my list! Got any parties still to go to this week? This season is ALL about the velvet, friends. It’s everywhere, making it pretty easy to pick up a piece or two if you don’t already have something to wear to family get togethers over the next week or two. I was able to find these fun velvet ruffle shorts in a few different colors for you guys if you’re into girly ruffles from time to time like I am! I love them for Christmas functions, but also for a fun New Year’s Eve look as well! I love your earrings, they are so perfect for the holidays!! Cute outfit! Such a cute look. That color combination looks amazing on you. I “think” I finally finished my gift shopping yesterday. Crossing my fingers I didn’t forget anything. Happy holidays. Love your look. Those velvet shorts are super adorable. So cute! Love the sweater and OTK boots! This velvet skirt is gorgeous, love how you styled it too! There’s nothing quite like wearing velvet during the holidays! Love this look! I’m obsessed with those boots!! gorgeous!! love this look, especially that sweater! That color is perfection and that sweater I need! You are so stunning! Love your velvet mini skirt! love the skirt hun! so festive and fun! This is the perfect holiday look! We are all about everything velvet at the moment. 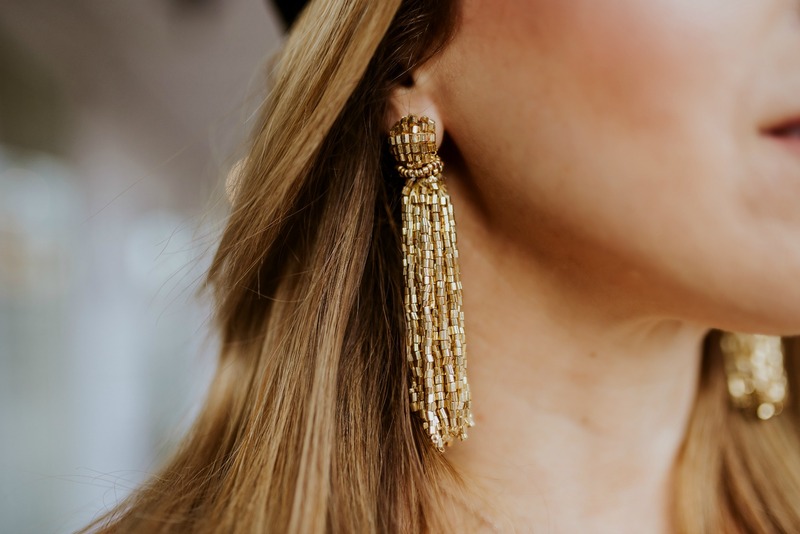 Love those tassel earrings too! !